East Frisia is a country in the northwest of Germany on a peninsula at the North Sea. That’s simple, isn’t it? When the European Institute for Tourism asked 1500 Germans in 2002, where East Frisia is located on a map of Europe, only very few of them did know it. The answers where from the area around Amsterdam in the Netherlands up to Copenhagen in Denmark. Every fiths did even not heard about East Frisia. Unbelievable. Many people have problems to find East Frisia, because they expect it somewhere in the East. However, it is located in the very northwest of Germany. This is East Frisia. Nowadays, it comprises the counties of Leer, Aurich, Wittmund and the city of Emden. This almost the same area of the former Principality of East Frisia (1464-1744) and that of the following administrative district Aurich, that was first part of Prussia and later of Lower Saxony (1744-1978). But the history goes back a long time ago. East Frisia was always a part of Frisia, which history began around the 8th century, just after the migration of the peoples in Europe. Frisia was a country at the coasts of the North Sea, reaching from the mouth of the river Rhine (today in the Netherlands) up to an area that is part of Denmark today. The Frisians had always some struggles with their neighbors int the south, the Franks, who conquered very soon the south part of Frisia. More to the north, two Frisian regions remained, divided by the small river Lauwers. Today, the Lauwers flows in the north of the Netherlands and is still dividing two regions: the Dutch provinces of Friesland and Groningen. The Frisians living eastern of the river Lauwers until the river Weser are still called Eastern Lauwers Frisians. It would be easy, if all these people would be called “East Frisians”. But it is more complicated. Parts of this area are not called Frisian anymore (the Dutch province Grongingen). 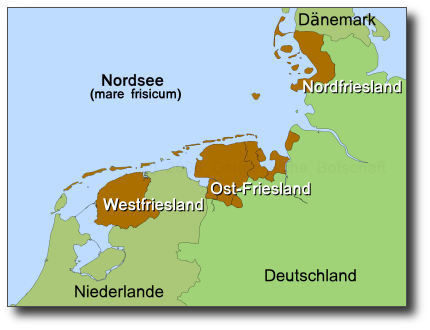 Some other people do not want to be called East Frisians (people in the German county Friesland). Also the regions eastern of East Frisia, the county Friesland, the city of Wilhelmshaven, the Saterland and some areas in the former Rüstringen and Wursten are not part of East Frisia anymore, but called eastern Frisian regions. It is only in East Frisia itself, where all people want to be called East Frisians. Only people in the Dutch province Friesland call themselves Frisians. They speak Frisian, as the people in North Frisia and in the Saterland do. That is why this province is called “Fryslân” in Frisian. 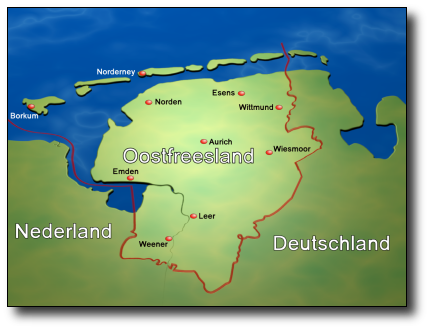 Moreover, there is a region called “Westfriesland”, west of the IJsselmeer in the province Nord-Holland. But the people there call themselves not Frisian anymore. Section “West” for the province “Fryslân” in the Netherlands. 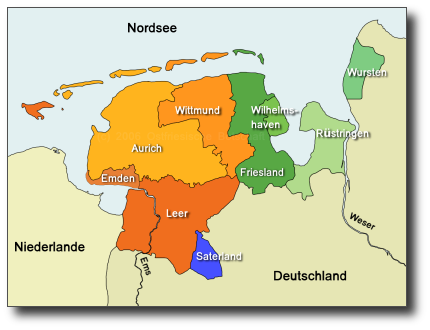 Section “East” for East Frisia, the county Friesland,the city of Wilhelmshaven, the Saterland, regiosn in the former Rüstringens and the Land Wursten (all in the north west of Germany today). Section “North” for North Frisia and the island of Helgoland (in the north of Germany today). Overall 1.2 million people live in the Frisian regions, almost half a million of them in East Frisia. Besides the Danish, the Sorbs, the Sinti and Roma are the Frisian one of the officially recognized minorities in Germany.